The introduction of arc fault detection devices is now turning electricians and switchboard builders into the most effective fire preventers since the first house was ever burnt down by an electrically caused fire. It is hard to believe that a major cause of electrical fires has now been brought under control by the simple DIN-rail installation of arc fault detection devices (AFDDs) into the final sub-circuits of a residential or commercial installation. This fire safety and people protection breakthrough has been achieved by combining the existing thermal protection provided by MCBs (and the additional protection delivered by RCDs) with arc fault protection, and delivering this comprehensive level of safety in a fully integrated three-module device. 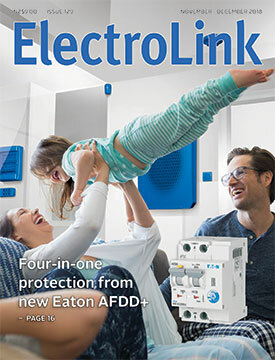 Where the new AFDD from Eaton goes even further, says Eaton’s Power Distribution marketing manager, Simon Rigling, is the extra level of safety delivered by the new Eaton AFDD+ which is now available through electrical wholesalers. Any suggestion that electricity distribution businesses are unfettered monopolies free to run their lines operations however they want, was not backed up in October when the Commerce Commission filed civil proceedings in the High Court at Auckland against Vector. The Commission provides regulatory oversight of lines companies and sets Vector’s prices and service quality using a price-quality path. Vector must comply with Commission regulations governing the maximum revenue it can collect and the minimum standards of quality it must deliver. Quality is measured in the duration (SAIDI) and frequency (SAIFI) of power outages set by the Commission relative to Vector’s own historical performance. These quality measures, for example, limit the average duration in minutes of network interruptions above which the network company is in potential breach of the Commerce Act. As part of its compliance with the legislation, Vector had reported to the Commission that it had breached its quality standards in both the 2015 and 2016 financial years. The subsequent Commission investigation found that Vector breached its SAIDI limit by 51 minutes in the 2015 regulatory year and 13 minutes in the 2016 regulatory year. Vector says it co-operated with the investigation but contested many of its findings. The company has agreed to pay an undisclosed fine as punishment. But the company is not yet out of the woods. Vector has also reported further breaches of its quality standards for 2017 and 2018. These breaches may now be subject to further investigation by the Commission. The uncertainty as to when the new editions of standards are going to be cited in the Electricity Regulations continues, with no word yet of any government commitment to proceeding with a regulation amendment that will recognise the standards for safe use by the industry. The Ministry of Business, Innovation and Employment (MBIE) has confirmed there are 21 standards or part standards cited in Schedule 2 of the Regulations and 130 standards or part standards cited in Schedule 4 that have been updated with either new or amended versions since the last amendment to the schedules in 2013. These new versions are designed to advance the electrical safety regime for products and the conduct of prescribed electrical work either through their mandatory application or as ‘deemed to comply’ solutions. Many of these upgraded standards have been developed by members of the industry serving voluntarily on standards committees, here and in Australia. They have done their job in bringing standards up to date, but the new standards they have developed remain unrecognised by the government, and compliance for products and electrical work remains tied to the old versions that are currently cited in the Electricity Regulations 2010. ElectroLink has been assured by MBIE health and safety policy manager, Saskia Patton, that “work to update the Regulations is on MBIE’s work programme and is being advanced.” She says the pace of this work is expected to increase when priorities and resources allow. Designing a water pumping solution might start with sizing the preferred pump, but if you want to manage water flow in the most reliable way that saves energy while reducing wear and maintenance costs, then selecting the right VSD or soft starter to control the pump will give the best result. Whether it’s a single pump job or a multi-pump project, ABB has a complete offering specifically designed to solve any water movement need and overcome the typical problems encountered in aging pumping operations, says ABB’s water drives manager, Jonathan Aarons. He says problems like water hammer can be addressed by upgrading to a new ACQ580 VSD with its built-in soft-pipe-fill function makes sure there is less water hammering on the pipes. Water hammering typically results in wear in pipes and valves when starting and stopping the pump, while quick ramps protect bearings when a submersible pump is started. 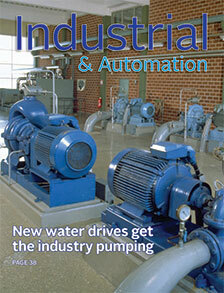 Among the early adopters of the new ACQ580 are pumping system suppliers, Brown Brothers Engineers. The company’s CBS manager, Adam Souness, says the pumping controls and protections are key to the pump applications Brown Brothers designs for its clients. Competency and training are always a hot topic and one that has as diverse a range of thoughts as to what it is about. Is it judged by a qualification or a degree that somebody earns because they passed the right exams? No, because that only speaks to knowledge. Is it then judged by experience? No, because experience alone is not a proof of getting it right. Is it then judged by skill? No, because performing a task with only skill is not a proof of getting it right or of good judgement. Is it something a regulator prescribes in law? It can be, but that is a last recourse when training is failing. Competency is not a single thing. It the combination of skills, knowledge and experience required to carry out an occupational task effectively, efficiently, repetitively and safely, and no longer with the need for supervision. The last piece of the puzzle is attitude. Competency is also the entry-level step on the way to expertise, and this is what we need more of to deal with the increasing complexity of industrial electrical work and the vast range of technologies powered by it. 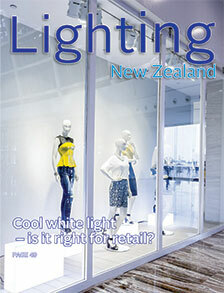 Cool white light – is it right for retail? People sometimes request cool white lighting for retail lighting in the belief that it will create a brighter and more attractive effect. But are they looking at the right lighting measure to achieve this result? Helping shop owners make the right lighting choices requires not just getting enough light onto merchandise displayed, but also imparting a good understanding of the difference between the colour temperature of a lamp and the colour we see reflected back to us from the objects lit. How we address these different lighting measures affects perceptions of brightness and how we see true colour – vital factors in lamp and fitting selection for retail premises. Human centric lighting – or HCL – is a term for systems that control artificial lighting in a way that is intended to replicate natural daylight to improve human health and comfort. Healthy lighting is a popular topic for the international lighting media and you may also see HCL systems being promoted by manufacturers. It’s claimed that HCL can improve recovery of hospital patients and the well-being of people in aged care facilities, enhance study and learning for school children, limit jetlag, reduce seasonal depression, and increase the productivity of office workers. In this issue we will focus on HCL in medical facilities and look at the evidence for improved recovery times with better lighting.